This class is designed specifically for students who have already completed Advanced Throwing Part One. Now we are going to really stretch the clay and create forms that make our souls sing! Since you took part one, you can throw finished pots (no trimming), you can move clay where ever you want it, up, down, out or in. Now it is time to design and execute your unique style with refinement and excellence, words you will hear a lot. Class critiques and exploring the “what if’s” together stimulate even more exciting pots. 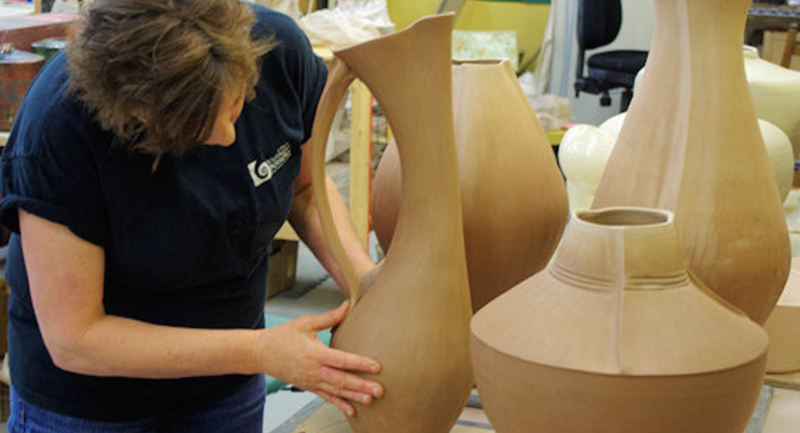 We will sketch the clay to its limit, making sets, some big pots and multiple approaches to spouts for pouring Vessels and incorporating slabs into thrown pieces. It wont be easy but it sure will be fun! This class includes 16 hours of open studio time. Extra studio time can be purchased at 10.00 and hour. Register now!